The bad-tempered Michelangelo Merisi da Caravaggio is born in Milan, Italy and is trained in painting by a disciple from Titian. From an early age, the artist always got into fights and, because with “some differences” with a police officer, had to move to Rome by mid 1592. After the reform, the Roman Catholic Church was in search of religious art, as a way to counter the threat of Protestantism. For this task, the artificial conventions and postures of the mannerism weren’t enough and, there, Caravaggio, the radical, found his niche. 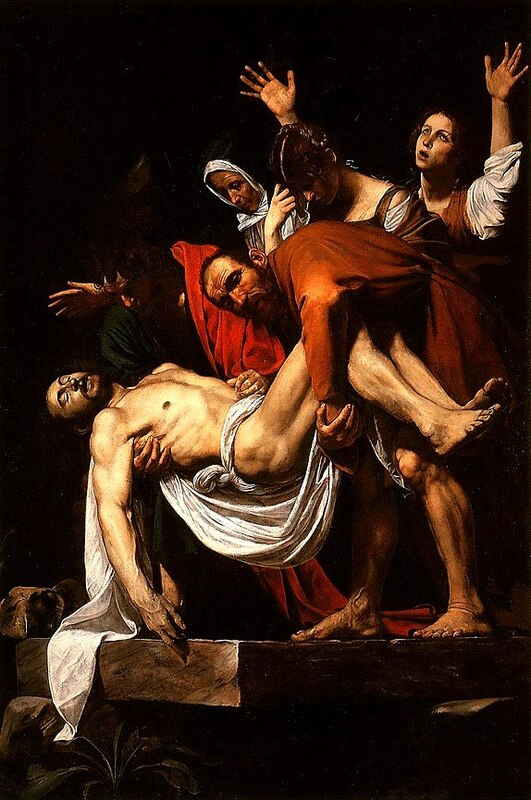 The entombment of Christ is an example of a really caravaggian painting. On the contrary of his first works, really boring paintings with children, music, fruit baskets and other motifs; today’s canvas has all the rock and roll. Here, we see 6 characters. 3 Marys and 3 men. With her arms wide open, on the upper right side, we see Mary of Cleofas. With a hand in her forehead, we find Mary Magdalene and, behind her is the Mary that gave birth to Jesus. Holding Christ legs, we find Nicodemus and, holding Jesus’ torso, we see St. John. At the bottom, the son of God is dead. The composition is thought in diagonal, starting with the arms open of Mary of Cleofas and ending in the lower left corner of the canvas, pointed by the arm of Christ. The scene is dramatic, and we can see the suffering that it is expressed in different ways by the characters. Except for the face of Christ that, although he has the hand of John over the wound in his ribs, he feels no more earthly pain. The representation of the characters is, at least, curious. Christ, instead of being idealized, white and pure, as he was often represented, here we find him with a hard worker contexture. The characters are all dressed with clothes of the 16th century and Mary, Jesus’ mother, is even dressed like a nun. However, the most important character of the work, after Christ, is Nicodemus. There are versions that say that, in the painting, Nicodemus is in clear opposition to the figure of Christ: it seems that, the first had a great job position and was extremely rich, while Jesus represented the poor. Nicodemus, in Caravaggio’s painting, is dress like a slum and appears disproportionate: the hunched torso is extremely small for his head and his legs. And trust me: Caravaggio didn’t make mistakes like that. It is believed that this troll-like appearance was intended to make a contrast with the strong and worthy figure of Christ. As if two worlds were opposite: the divine and the earthly. Finally, something very interesting in this painting is the point of view: the spectator is in the same plane where Christi s going to be left, which makes one to put himself in Jesus’ shoes. However, beyond of all of the above, what makes Caravaggio one of the most important artists of all times, and one of the favorites of Silver and exact; is the handling of illumination. He uses the chiaroscuro technique, but he takes it to the extreme, by suppressing the intermediate values of light. Like that, his paintings contrast between a bright light and a sepulchral darkness, receiving for the same time the category of “tenebrist”. With this technique, not only he would influence the baroque, but a lot of artists after him as well, like Georges de la Tour, Giuseppe Ribera or Rembrandt. ~ by Álvaro Mazzino on November 5, 2010. Donovan thinks there is greater scrutiny for black quarterbacks. This entry was posted on November 5, 2010 at 14:59 and is filed under Baroque.You can follow any responses to this entry through the RSS 2.0 feed.You can leave a response, or trackback from your own site.